Watch this space for updates on all our awards as well as events that we will be attending across the country. In addition to picking up gold awards for many of our products, we are absolutely thrilled to have been awarded Taste of the West Producer of the year. The ceremony took place at The Great Hall at Exeter University, attracting an audience of over 400 fanatic foodies. With the help of BBC television presenter Victoria Graham, a staggering 42 awards were given out to 38 South West food & drink businesses. 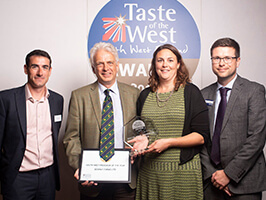 The Taste of the West Awards have been running for over 25 years and the annual programme rewards the very best food and drink from across Cornwall, Devon, Somerset, Dorset, Wiltshire and Gloucestershire. They truly are regarded as a benchmark for excellence across the whole South West region. This year over 1,000 products and 330 hospitality and retail establishments entered the awards, so you can imagine our pride in being named Producer of the Year.